Insider tips from Michael and Pamela Yardney — including 19 ways to get into your dream home sooner. All You Need to Know About Buying and Selling Your Home allows you to view the property market through the eyes of 2 Australian experts who give some surprising answers to more than 150 questions you must ask before buying or selling your home. This book allows you to view the property market through the eyes of 2 Australian experts who give some surprising answers to more than 150 questions you must ask before buying or selling your home. Do you know how to get the best finance for your new home? You may not realize that some banks will lend you 95%, 100% or even 103% of the value of your property. Do you know how to determine what a house is really worth? There is no one right price for a house, just a fair market price range. And if you know how to buy at the lower end of the range and not overpay, you may find yourself a bargain. 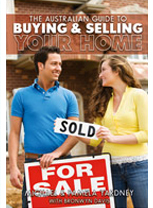 Do you know how to choose the right agent to sell your house? And do you understand why some properties should be auctioned to achieve the best price and why other properties are best sold privately? Do you know how to make your home appealing to a wider range of buyers so as to maximise its sale price? And do you know why you are likely to receive the best offer on your home in the first few weeks of the marketing campaign? This practical guide will give you step by step advice on how to find the home of your dreams, or sell it when you are ready to move on. For more tips on wealth creation through property investing, see the rest of Michael Yardney’s books. FREE CD – An audio interview with Michael Yardney “An insider’s guide to property investing”. Value $49.